Having just wrapped up four days in Halifax for the Atlantic Canada Wine Symposium, I was given three bottles of Nova Scotia wine to take back to British Columbia with me. I am not unfamiliar with the young industry out there. It reminds me of the Okanagan Valley 20 years ago when I arrived from California. 15 wineries. So much enthusiasm, hope and promise. The wines are crisp, cool, refreshing, and low alcohol (the “hot” thing now). The friendliest bunch of producers you’d ever like to meet. I also took home 7 live lobsters caught fresh from the waters surrounding Nova Scotia. Anyone who has gone to the Halifax airport is familiar with the pools of fresh lobster you can choose from just next to the security gate entrance. I had a chance to meet some Nova Scotia lobster fisherman last year on a family vacation. As good a bunch of people you’ll ever come across. What could be more perfect? The marriage of two Canadian-grown products, one grown in our seas and one grown on our land, that travel in one day across this huge country of ours and end up on my table in Oliver, BC. That’s true patriotism in my book. Not flag waving but supporting in a real way what we do here. The similarities between the Lobster7 and the Canada3 end here. The Lobster7 were purchased before I checked in. They were boxed up (still alive–I know, I’ve had a hard time with this part of the story). They were carried on the plane and placed in the overhead bins—riding the plane with the big people. They flew across 9 of our 10 provinces and arrived at their destination 12 hours later. The most well-known product from Nova Scotia was unpacked and lowered into their steam bath of doom. Around the table were four friends, my husband, me, and my seven-year old daughter. The Lobster7 were accompanied by a home-made butter (although they did not need it). They were delicious. Oh, and did I mention that you can also order these live lobster from your home and have them shipped to you? Anywhere in Canada. Meanwhile, the Canada3 were not so lucky. They were acquired the night before departure, wrapped in copious amounts of cardboard, 2 pairs of wool socks, various pieces of clothing, and put in my checked bag. No overhead compartment for them. They rode on the underbelly of the plane in a sea of luggage—no guarantee they would survive their trek. And theirs was an illegal journey. Alcohol, even for personal consumption, is not allowed to cross provincial borders. An antiquated law from 1928 and politicians without the courage to stand up for a truly entrepreneurial industry have ensured that nothing has changed in decades. The best-hidden secret from the Island (three Nova Scotia wines) were chilled, cracked open and enjoyed by all (including a sip or two for my seven-year old—like it should be). Local foods being paired with local wines. One matching the other. The way it’s done in wine regions around the world. Wine is food. Canadian wine should be enjoyed by all Canadians who choose to partake. I want my daughter to be proud of what her mother does when she grows up. I don’t want her to think of me as a bootlegger. I want her to crack open a bottle of estate grown Canadian wine and enjoy. With a home-grown lobster if she chooses. 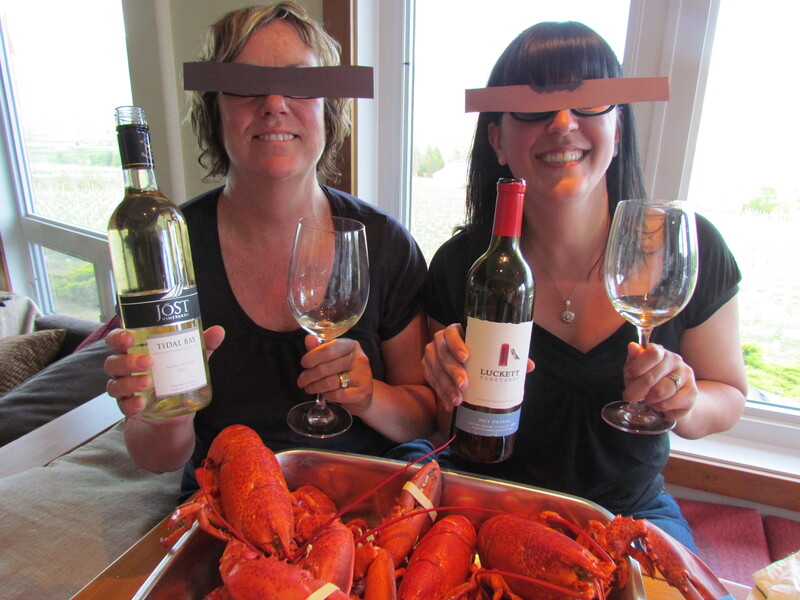 This entry was posted in Grapes and Wine and tagged atlantic canada, BC, canada, jost, lobster, luckett, nova scotia, wine. Bookmark the permalink. Great story. wish i’d been to your dinner party. What a wonderful story Sandra. My travels in 2010 to N.S., Cape Breton, P.E.I., then leaving Halifax with lobster from Clearwater to share with friends in Calgary makes me appreciate your amazing Canadian experience. Oh Sandra, you amaze me with this epic tale of adventure! Love the combo of humour, truth and sadness. Smacks of all the great elements of the plays of the ancient Greeks. I adore you. 🙂 I sure hope we can get this law changed SOON! Actually, Sandra, if the journey had been reversed – if I, a Nova Scotian, had visited you in B.C. for example and brought back some wine – it would not be illegal. Nova Scotia policy allows residents to bring back reasonable quantities of alcohol from other provinces if it accompanies them during travel. For wine, the “reasonable quantity” is one 9L case of 12 bottles. I understand many provinces have similar policies for product accompanying travelers. I do not know what B.C.’s law is on this, though. It may not be legal there. That is true, but I was not sure which provinces in which that was the case. The personal carry across restriction is pretty stupid but let’s face it, it is not enforced.